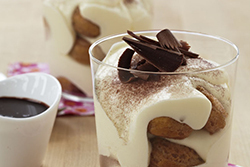 Ladyfingers dipped in espresso, layered with mascarpone cheese and topped with chocolate sauce, you will fall in love with this traditional Italian dessert! In a large heat proof glass bowl beat egg yolks and sugar for 5 minutes on medium to high speed. Place bowl over a pot of simmering water and continue beating until the mixture doubles in size. Remove bowl from heat and add the containers of mascarpone cheese and continue beating until very smooth. Place bowl in the refrigerator to chill. In a separate bowl, beat heavy cream with 2 T of sugar until stiff peaks form. Fold the whipped cream mixture into the bowl of the cheese mixture and chill. In a shallow casserole dish combine ¾ c of the espresso, ¼ c of the Kahlua and the condensed milk. Dip the lady fingers in this espresso mixture one at a time and layer in the bottom of a trifle dish or any decorative dish you desire. Top first layer of lady fingers with a third of the cheese mixture. Repeat this process one or two more times depending on the size of you dish finishing with the cream. Sift the cocoa powder over the top layer of cream and top with the chocolate curls. Refrigerate for at least 4 hours in a trifle dish or 8 hours if slicing from a rectangular vessel. Paella is a traditional rice dish originating from Spain. Today paella is made all over the world using just about any ingredient that goes with rice - from shellfish, squid, vegetables, chicken or pork. 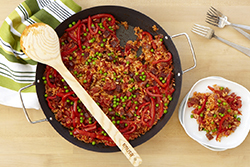 This recipe uses chorizo, saffron, garlic, tomatoes, red pepper, and peas to create a flavorful Spanish-Influenced meal! Pre-heat oven to 400 F. In a small saucepan heat chicken stock with saffron and keep warm. Inside your IMUSA PAELLA PAN add olive oil and bring to medium-high heat. Add chorizo, onions, and garlic and sauté for about 3-4 minutes. Mix in rice, paprika, and salt and stir until well combined. Add tomatoes and mix evenly. Add about 2 cups of the warm chicken stock and allow to simmer on medium heat for 5 minutes without stirring. Add another cup of stock and simmer for another 5 minutes. Add final cup of stock and put pan in the oven and roast for 10-15 minutes, until all of the liquid is evaporated. If the rice looks too dry add a small amount of stock or water and cook a bit longer. 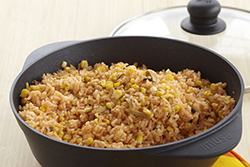 When the rice is ready, remove from the oven, sprinkle green peas and let sit for 5 minutes before serving. 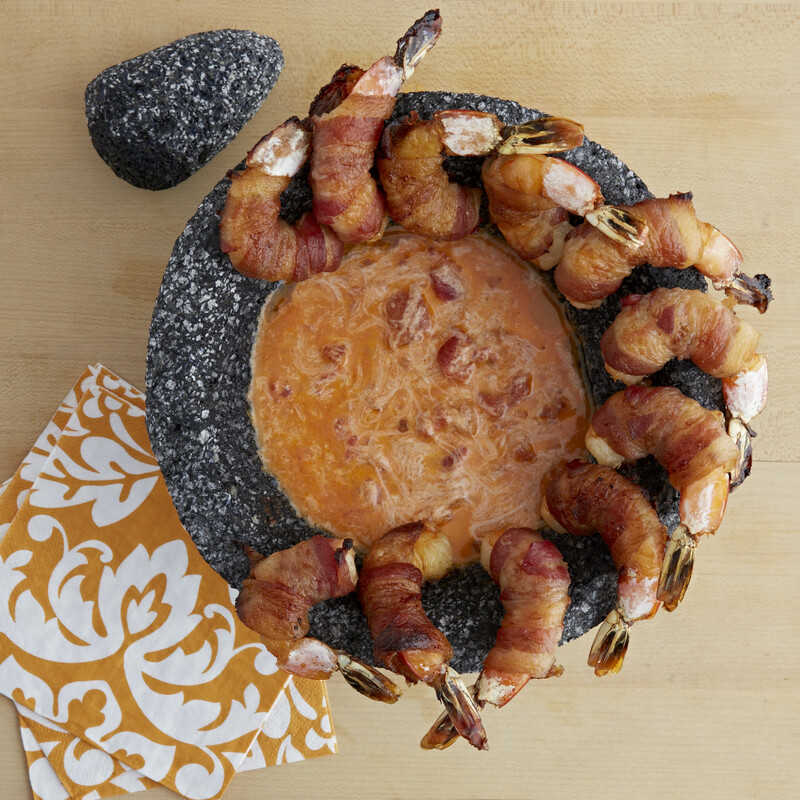 NOTE: You can make a seafood paella version of this recipe by replacing chicken stock with fish stock and adding raw shrimp, scallops, and clams onto the rice before adding stock. SERVES 10 TO 12. Raise the heat to medium-high and add the ground beef (the meat should make a searing sound when it hits the pan—use a small amount of meat to test the heat; if it doesn't, increase the heat to high for a few minutes before adding the meat). Stir frequently to break up any large chunks of meat, and cook, stirring frequently, for 3 to 5 minutes, until the beef is thoroughly cooked (no longer red). A frittata is an omelet of Spanish origin - usually made with potatoes. 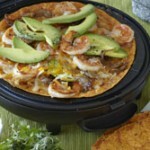 This Spanish Frittata is a wonderful weekend brunch or a light weeknight dinner. Serve hot or at room temperature and serve with crusty bread! 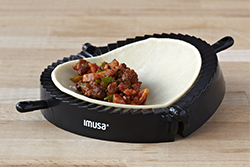 Add 2 tablespoon of the oil to your non-stick IMUSA egg pan and heat over low. 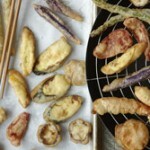 Cook potato slices in oil until golden brown. Remove from pan and set aside. Add peppers and onions to pan and sauté for a few minutes until softened. Whisk eggs with salt & pepper in a bowl then add your potatoes, peppers and onions and mix. 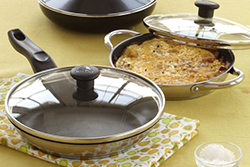 Wipe your pan clean with a paper towel and add the remaining olive oil. Add your egg mixture and cook on low until eggs are set; about 7 minutes. Top with Parmesan cheese and olives and cover with foil. Your frittata is ready when eggs have completely cooked through. Top with cilantro and serve.